I don't know about you, but for me Christmas Day lunch is THE best meal of the year - and whilst I might leave the cooking to someone else, decorating up the table is most definitely my job! So this year I thought I'd show you how even with a small table and tight budget (I used lots of things I already had, spending just over £35), you can still eat your turkey in style. We don't have a dining room in our home, so we use our conservatory as a space for my table and chairs (a hand-me down that I upcycled - read my DIY tutorial here). When styling my table, I've try to keep the look as simple as possible as it's obviously quite small, and so too many accessories could overpower it a bit, ending up looking cluttered. The white runner also gives the table a clean background to place items on. I think its always a good idea to have one large focus piece, and style smaller bits around it, so I've gone for this stunning artificial mini Christmas tree, which was only £14.99 from Fenwicks, which I've styled with some mini baubles from John Lewis. I've also wrapped a velvet ribbon around the pot to jazz it up a bit. Along the runner I've scattered some pine cones, faux acorns, and fairy lights which all came from Sainsbury's. 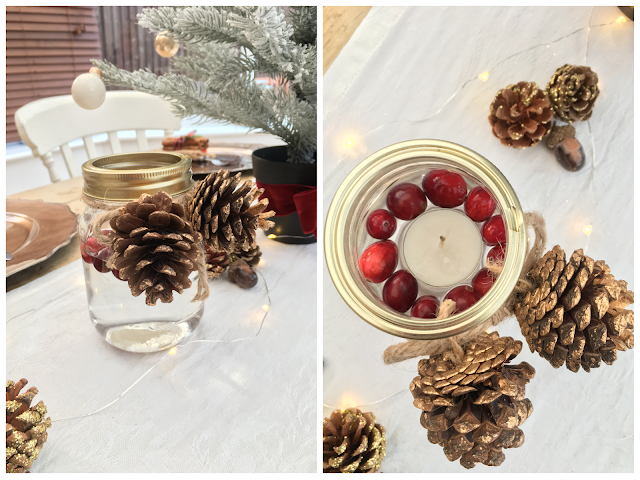 In addition to these I've decorated some mason jars by tying some pine cone decorations around the top, and dropping a tealight and some cranberries in the water - so simple and in total cost me the price of the cranberries (£2.00!) as I already had all the other bits lying around. Finally, for the place settings I've used a simple piece of folded hessian to create a cutlery holder, placed on these lovely Charger plates - 99p each from Dunlem. I added these lovely cinnamon sticks, which are tree decorations from Tesco - £1.00 each on a 3 for 2 offer. The finishing touch comes from these absolute stunners of wine glasses which I couldn't resist - only £6 for two in Asda. Hope this has been helpful when thinking about how to decorate up your Christmas lunch - how will you be styling your table this year? Tag me over on Instagram @dove_cottage or Twitter @dovecottageblog - I'd love to have a nose! If you're looking for more festive decor bargains, have a look at my 'Update your home for Christmas for under £20' post here. Lovely Christmas decorations. Loved all colors, lighting and glitter for this chic party. We got to see such beautiful Christmas décor recently at Seattle convention center. Attended couple of Christmas special events there.